5:30pm-7:30pm Summit Social: Attendees will take the Cannon Mt Aerial Tramway to the summit of Cannon Mountain and be treated to a beer from Woodstock Brewery, race friendly appetizers, nutrition sampling, and of course a beautiful sunset across the White Mountains. The Summit Social will also feature a Pre-Race Chat / Visualization seminar with The Davis Method coach Ryan Davis. 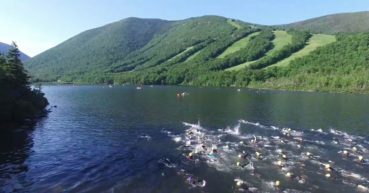 • 5:30am-9:30am | Race Day Packet Pick-Up & Registration at Peabody Lodge, Cannon Mt. • 6:45am | Mandatory Race Meeting at beach for ALL Half-Iron athletes on the beach. • 8:15am | Mandatory Race Meeting at beach for ALL Olympic athletes on the beach. • 10:00am | Mandatory Race Meeting at beach for ALL Sprint athletes on the beach.